A seductive-looking Vampirella by Joe Jusko. I start my Monthly Musings with a picture of Vampirella as usual. Sadly, this is the last of the artwork I have by Joe Jusko, my favourite Vampirella artist. I hope I can find some more of his fabulous paintings of Vampi to show here in the future. Nevertheless, I am not short of Vampirella artwork to showcase on my blog. I haven't decided who to highlight next time - I'll decide closer to the date. Speaking of Judge Dredd, my Judge Dredd Miniatures Game campaign got off to a flying start. The two batreps I presented this month were very well received, with everyone who commented liking the comic strip format I chose to showcase them. 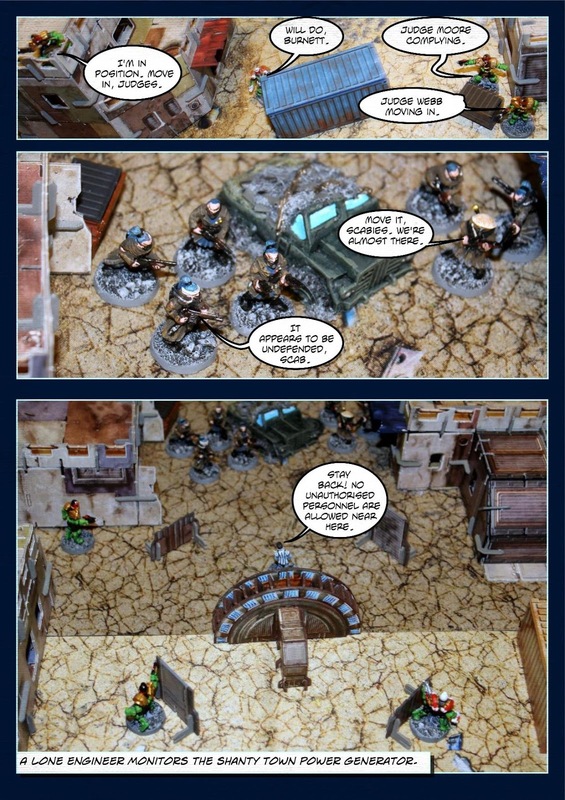 The comic format is here to stay and may well be used for other batreps. I think it would work very well for some zombie apocalypse games. Getting back to JDMG, I have at least one more batrep planned for February, which will introduce two new Judges in a scenario called Breaking Bones. This is a scenario that I have created and moves away from the shanty town district into the streets of Mega City One. Work continues on getting my collection of Judge Dredd figures finished painting with good progress having been made this past month. I really did enjoy the Tweak painting challenge with Andy, Dave and Simon. 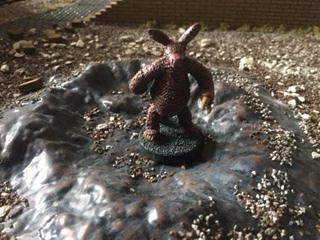 I am working on a small project to make a group of unique figures for my JDMG campaign - Boingers! They are nearly completed and I hope to show you them next month. This range of sci-fi scenery items was sculpted by Dave Stone, with input on what he should make from Andy/Da Gobbo. Simon/Blaxkleric and myself. 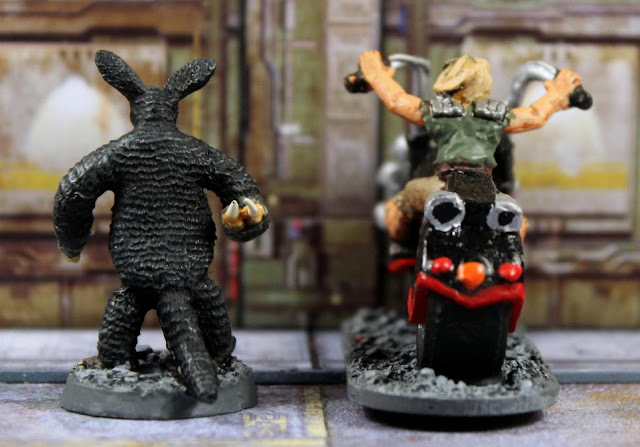 Obviously, I'll be using these items on my Mega City One game boards, but they have been designed for use with any sci-fi setting. The three initial sets available are Garbage Disposal Units (price £1.50), Prisoner Posts (price £1.00) and Sci-Fi Sports Car - Lamborarri 2000 (price £5.00). Prices given are for the unpainted versions. I think they are excellent and very reasonably priced. I've ordered two of each set for now. More orders will most likely follow. It is a great thrill to see these items that I asked Dave to sculpt not only get made but also get released to the public. I don't have much else to report so I'll sign off now. Thanks for reading. In this post I'm going to look at two of Judge Dredd's allies who accompanied him in his epic mission in The Cursed Earth Saga - Tweak and Spikes Harvey Rotten. This story appeared long ago in Progs 61 to 85 and saw Judge Dredd leading a small group of Judges on an arduous journey across the Cursed Earth, transporting the vaccine for the deadly 2T-FRU-T virus that was devastating Mega City Two. After humans arrived on his home planet, Tweak arranged for his people to go into hiding underground until he could gather more information about them. After utilising the power of mind probes he was able to determine that human history was littered with violence, exploitation and hatred - so, as President of his world, he decided that no contact should be made with the humans at all. After his children were captured, Tweak decided to let himself be captured and posed as a "dumb alien" rather than risk the humans exploiting the vast mineral resources of his planet - which Tweak's people ate - and leaving Tweak's race to starve. Convincing the humans he was unintelligent, Tweak and his family were sold into slavery in the Cursed Earth, although he was separated from them. After escaping and finding his family dead Tweak was recaptured but escaped again, thus the Slay-Riders were employed to kill him. Judge Dredd stepped in to save the alien, upon which Tweak helped him to deliver the 2T-FRU-T virus antidote to Mega City Two. After the mission, Dredd arranged for Tweak to be returned to his home planet. Dredd insisted the planet was of no value, and Tweak's people were left in peace. 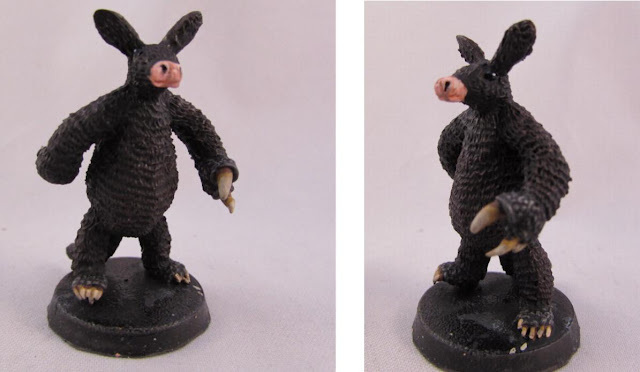 This resin cast figure of Tweak was sculpted by Dave Stone of Wargames Terrain Workshop. He very kindly sent me one as a Christmas present last year. He also gifted copies to Andy/Da Gobbo and Simon/Blaxkleric. These figures are not available for sale so I felt very honoured and privileged to receive mine. Dave, Andy, Simon and I have decided to have a small painting contest, just for fun, to paint our Tweak figures. More on this later. Not surprising, there are no stats for Tweak in JDMG but I came up with these stats for him. Type: Level:3 Alien Infantry Hero. Stats - Psi:7, Move 5", Agility +0, Shoot -1, Melee +2, Melee Dice 3D, Will +1, Armour +0, Hits 4. Weapon - Crushing Claws with Damage 2 and AP-2. Talents - Concentrated Mind, Mind Shield, Skilled and Deadly and Stealthy. If hired as a mercenary, Tweak costs 155 Credits. Spikes Harvey Rotten was a biker and a criminal. Dredd had him paroled from custody to accompany him on his perilous mission across the Cursed Earth desert, as he was familiar with the territory from his days smuggling guns there. When all of the Judges who accompanied Dredd were killed along the way, Spikes still fought by Dredd's side. He was killed only a short distance from Mega City Two. 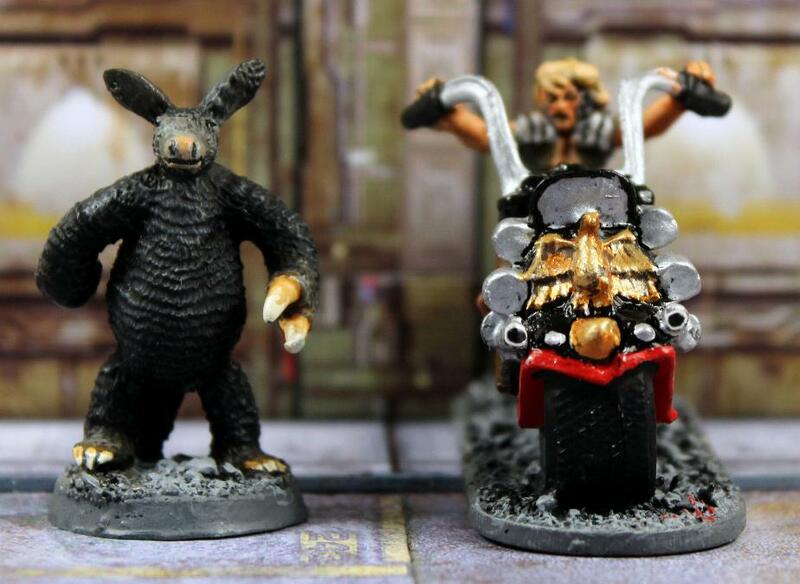 The figure of Spikes riding a Lawmaster Bike was produced by Warlord Games for JDMG. Classed as a mercenary, he may be used by either the Justice Department or a street gang. If used by a street gang, he rides an Otomo K-9000 Street Bike instead of the Lawmaster and his Credit score drops by 50 Credits. He is a Level:3 Punk Infantry Hero armed with a Stump Gun and possibly, a Hand Bomb, which he sometimes wears as an earring. His Talents are Brave, Drive-by Boot, Hunker Down and Luck of Grud. He costs 220 Credits if hired by the Justice Department or 170 Credits if hired by a street gang. It was Dave's suggestion to name this friendly painting contest the "Tweak Off". This is Dave's entry. 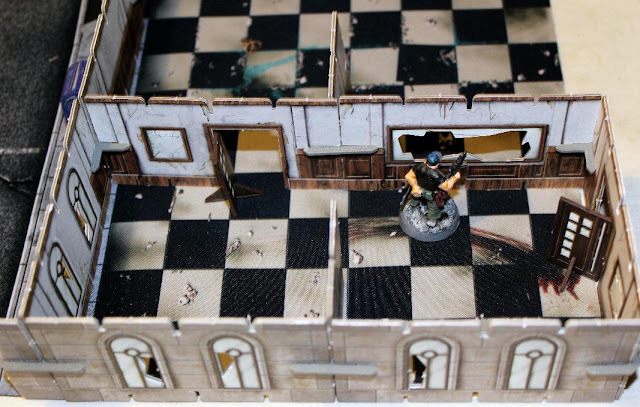 Seeing as Dave does not have a blog I offered to showcase his entry on my blog for him. Dave has also gone for black fur but his snout is more pronounced than my version with a much sharper contrast between the flesh and the fur. I should point out that the figure is a one-piece casting with its integral base. Dave's version is the one most closest to my own. It is interesting to see how all four of us have approached this task and come up with four different versions of the same figure. As I said, this contest was done purely for fun. There are no prizes to be awarded or votes required for whose version you think is the best. I enjoyed taking part and once again, I'd like to thank Dave for kindly sending me such a wonderful figure of a character I always liked and felt great sympathy for. You can't help but feel sympathy for Tweak when Dredd discovers what happened to Tweak's wife and children. Eating has become not just a past time, but a sport in Mega City One, with food contests spreading throughout every sector. Fatties, despite their massive appearance, are actually highly trained individuals, dedicated to consuming as much as they can, and growing as large as they can. At the time of writing I have 14 Fattie figures and I'm dividing them into three groups according to their size. I'm going to start off by reviewing my seven Lightweight Fatties. I'll show you my four Middleweight Fatties and my three Heavyweight Fatties in a later post. 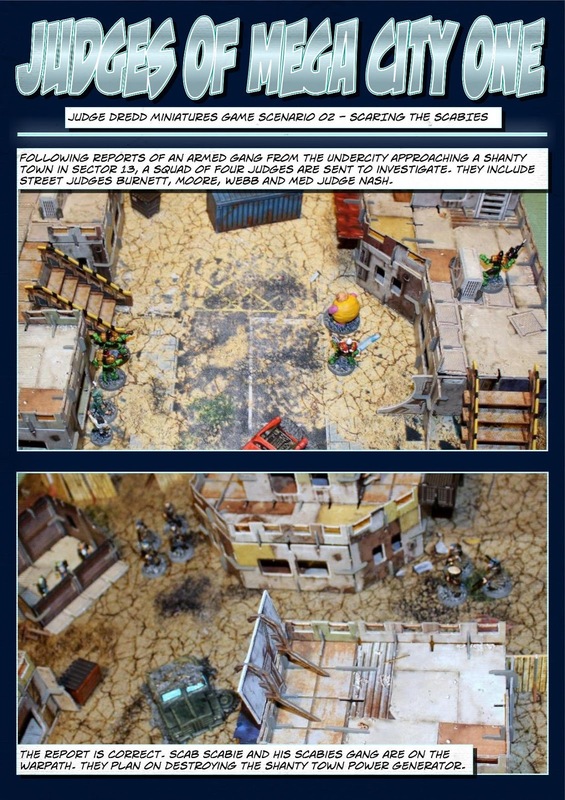 All of the figures shown in this post were made by Citadel Miniatures for the Judge Dredd Role Playing Game, published by Games Workshop in 1985. I have yet to name any of them. At the far left is a Fattie holding a placard saying "Feed me" on one side and "I came, I saw, I had some lunch" on the reverse side. I added his larger shoulder pads by sculpting them out of Milliput. I also expanded his belly slightly (again with Milliput) just to make him a bit fatter than his colleagues here. He has a small food tray hanging around his neck, presumably to keep his food closer to his mouth. Next to him, this Fattie is an unconverted figure. He is munching on a jumbo-sized hot-dog. Note how the buttons around his belly have popped open. The other two Fatties are both enjoying a large ice cream. Neither has been converted. The one at the far right looks remarkably like former comedian and nightclub owner, Bernard Manning. A key feature of all Fatties is their Belliwheels, a single wheel that fits underneath their huge bellies to help support their weight and to aid in their movement. 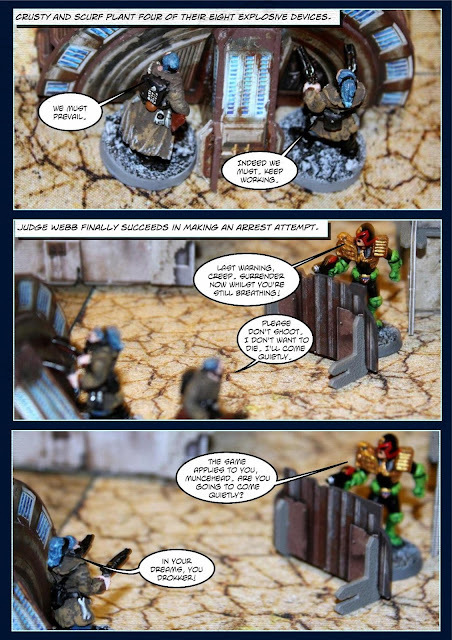 In the Judge Dredd Miniatures Game, Fatties have the following special rule regarding Belliwheels. Once a Fattie gets going, there is little that can stop him. If a Fattie takes two consecutive Move or Melee actions in the same turn, the second Move or Melee action must be made in a completely straight line, but will move an additional D10+2". In addition, the Fattie's close combat attacks will ignore all Armour except against vehicles and have a Damage score equal to the Fattie's remaining Hits (Fattie Level:0 Minions start with 6 Hits). Fatties may only move in clear terrain. The two Fatties to the left of the photos directly above and below have been out shopping, buying more food. The one at the far left had the gap uncovering his belly filled in with Milliput. For the Fattie in the centre I added his larger shoulder pads and elbow pads out of Milliput. It always bugged me that all of the figures of Fatties were male. Whilst I can't remember seeing any female Fatties in the Judge Dredd comic strips, surely they must have existed. Women are just as likely to binge eat as men. So I came up with this conversion of a female Fattie. I added more girth around her belly and backside, added large breasts and sculpted a new head and right arm for her. I'm happy with the result and it does make her unique. The picture to the left of here shows a Citadel Fattie in its original state. They came in three parts. As you can see from my photos above, they came with a random selection of right arms and left body halves. I don't know how many different versions there were, but I bought quite a few. This photo was taken from a seller on eBay, who, at the time of writing, was asking £25.00 for this figure. 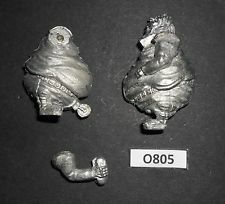 Another seller had more of these Citadel Fatties for sale but was asking £52.00 for each one! 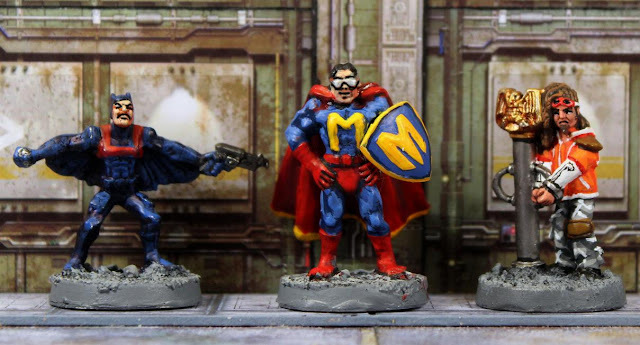 In the Judge Dredd Miniatures Game, mercenaries are most commonly used by a force when facing a stronger enemy. While mercenaries will allow players to always fight on an even scale, they are usually expensive to use and will always leave your force after their work is done. Some mercenaries are no better than common grunts, but can be used in vast numbers, while others are great heroes or celebrities, known across Mega City One and beyond. They are also a good way of gaining models that are not normally accessible in a force list. Whenever a player finds he is facing a force of greater points value in a campaign, he may use any number of mercenaries to bring his force into balance. Once a battle has been fought with mercenaries, they are removed from the force immediately - they never gain Experience Points. Mercenaries come in many different forms. Some are usable by the Justice Department, including such notable Heroes as Judge Dredd, Chief Judge Hershey and Psi Judge Anderson. Others are infamous perps such as the Executioner, Oola Blint, Orlok the Assassin, Sabbat and Stan Lee. And others are unnamed generic figures such as a Bat Burglar, Futsie, Robodoc or Vid Reporter. I'm going to showcase just a few of my own mercenaries in this post. 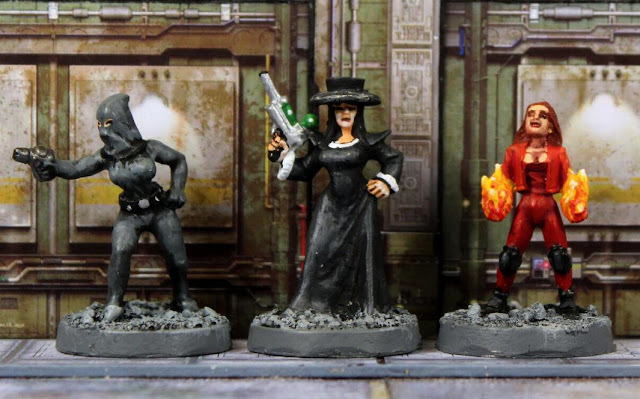 All six figures were produced by Warlord Games. First up is the Bat Burglar, whom I upgraded from a Level:0 Infantry Minion to a Level:1 Infantry Hero and gave him the name of Benny the Bat. Batting is a popular, if somewhat restricted, activity in Mega City One. Around blocks where it is permitted, citizens can be seen soaring the heights with rocket-assisted bat wings. Enterprising thieves have taken this hobby to heart, allowing them access to apartments on the highest lock levels to steal in through the exterior windows, which rarely have the same level of security as the block's interior. Benny is of course, equipped with his Bat Glider and is armed with a Handgun Pistol. His two Talents are Agile and Stealthy. Benny the Bat costs 130 Credits, whereas a Level:0 Infantry Minion Bat Burglar would cost 80 Credits. Another flyer is the Lone Vigilante known as Megaman. Although he is usually treated as a force on his own, he can be hired by other forces as a mercenary to aid their cause. It takes a certain kind of nut to decide that they will do a better job of policing the streets of Mega City One than the Judges. These vigilantes prowl the streets at night, looking for cheap punks terrorising the decent people of the city. Most turn violent, becoming little better than the scum they pursue, but others genuinely believe they are on the side of Right, and it is not rare for them to adopt a superhero persona. I have made Megaman a Level:3 Infantry Hero Flyer. But whereas the Bat Burglar uses a high-tech gadget to fly, Megaman uses the Psionic ability of Telekinesis to fly. He is equipped with an Energy Shield (it can absorb 10 Hits of damage) and a Medi-Kit. His four Talents come from two lists. From the He Knows Kung Fu lists he has Martial Artist (he loses the Weak rule from Fists and Feet attacks) and Black Belt Martial Artist (he adds +2 damage to his Fists and Feet attacks). From the Telekinetic lists I chose Concussive Blast (every model within 5" of him must pass a Will test or suffer -1 to all dice rolls until the end of their next phase) and Levitate (as long as he makes a Melee or Move action after using this Talent he may move 12" up or down as well as his normal forward movement for the action). Megaman has 7 Psi Points and costs 375 Credits. Third in line is a Punk called Rood Boy. The majority of street gangs in Mega City One are filled with cheap punks, petty criminals on the lookout for the one big score that will set them up for life. The average punk is selfish, mean and violent, though they often have some loyalty to the gang they have pledged themselves to. Rood Boy is a Level:0 Infantry Minion with no armour, equipment or weapons. His value is purely in making up the numbers of a gang that hires him. The figure shows him handcuffed to a holding post having been arrested for a minor offence. He'll soon be back out on the streets. Punks cost 20 Credits to hire. Next up are three female mercenaries. At the left is The Executioner. Thrown out of the Academy of Law in her twelfth year for a liaison with a man she eventually married, Blanche Tatum became a vigilante known as The Executioner as she hunted down the gangsters responsible for her husband's death. Her crime spree came to an end when Judge Dredd eventually caught up with her. She is armed with a Handgun Pistol and carries no equipment or wears any armour. She is a level:2 Infantry Hero with three Talents - Academy Star, Accurate and Brave. She is incorrectly listed as being worth 75 Credits. Her actual cost should be 160 Credits. I plan on bringing her back in my JDMG campaign as a different person but wearing the same outfit and using the same name of The Executioner. In the centre of this trio is Oola Blint. A strikingly beautiful woman, Oola became the Angel of Mercy, visiting the lonely, the desperate and the dejected to grant them the sweet release of a dignified death - whether they wanted it or not! Her identity was finally discovered by Judge Dredd in Shake-down during a raid on an apartment block when crime levels in said block were at an all-time high. However, she escaped to Brit-Cit (via Oz) with her husband, Homer, and opened a legal euthanasia clinic. Much to Homer's dismay, however, Oola began murdering people again (leading to Dredd being sent to Brit-Cit to investigate): she revealed her motive to be a sham when she admitted that killing was not the same when the victims "want it". She also revealed she intended to kill him as well, as a present for Christmas. 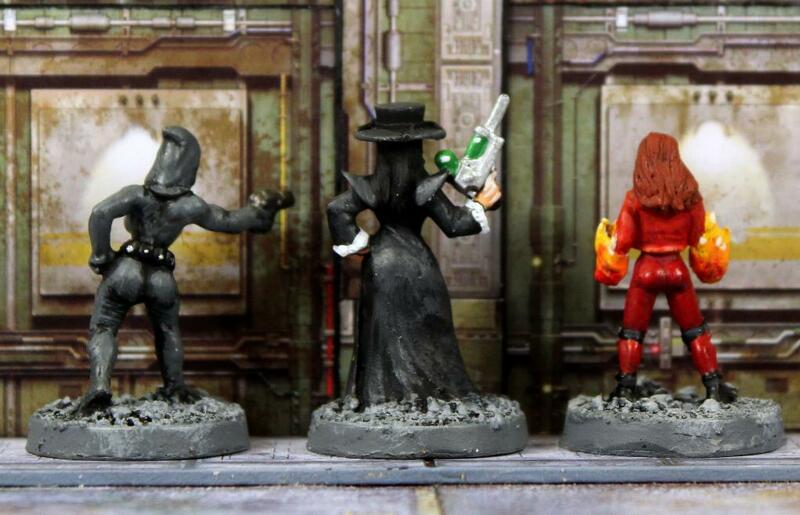 Homer informed the Brit-Cit Judges and they and Dredd raided the Blint's apartment block, but Oola had already fled after injecting her husband. Dredd managed to save his life and continued his pursuit. Oola willingly give herself up and both Blints were incarcerated for life for their crimes, in a couples block – but Oola refused to talk to Homer any more. Oola is a Level:1 infantry Hero with two Talents - Accurate and Stealthy. She is armed with a Poison Gun, which works the same way as a Handgun but if it causes any Hits to be deducted from an Infantry target (not a Robot) that model will automatically lose 1 Hit at the start of every subsequent turn until a Medi-Kit is used on it. If a critical hit is caused by the Poison Gun, the affected model will lose 2 Hits at the start of every turn instead. Oola costs 70 Credits. Finally, is a very powerful mercenary - the Pyrokine. Having spent most of her life hiding from the Justice Department's Psi-Division, the Pyrokine nevertheless has powerful abilities at her command, and has learned how to survive. On the streets of Mega City One these abilities command a high value. The Pyrokine is closely related to the Telekine in mental ability, but instead of concentrating on mind over matter, she focuses on mind over energy. By agitating particles in any solid object, the Pyrokine can cause fire to spring up spontaneously. The Pyrokine is a Level:7 Infantry Hero with a Psi score of 15. Her eight Talents are Concentrated Mind, Flaming Shroud, Incinerating Finger, Pyrokinetic Burst, Resist Flames, Silent Action, Stealthy and The Power Within. I have yet to give my Pyrokine a name. I was thinking something descriptive like Helen Burns, but I might go in the opposite direction and give her a less cliched name. I welcome any suggestions. The Pyrokine costs 225 Credits. 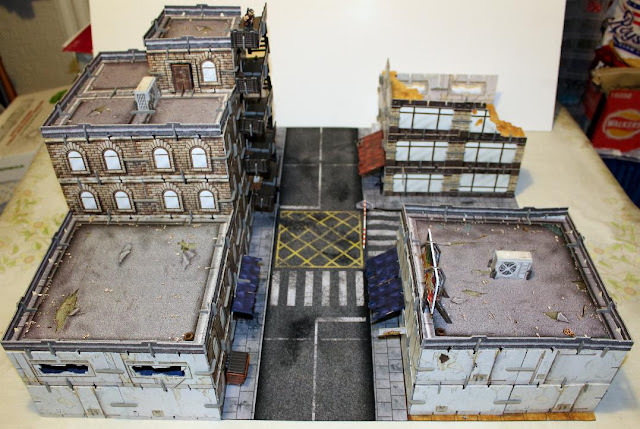 This is the second of my two Battle Systems Urban Apocalypse Terrain sets reviews that originally appeared in the defunct The Gamers Cupboard blog. I am reposting it here for the benefit of my followers who missed it when I first posted it. The text has been modified to bring it more up to date. With this post I want to show you the add-on sets to use with the Urban Apocalypse Cityscape sets. This is the new city block I came up with and as before it fits on a single mat measuring about 2 feet square (60cm by 60cm). On one side of the street I made a Fire Station and a small Police Station. On the opposite side of the street is a large Art Deco building consisting of a casino and a mansion. In the centre of the roofs of the Fire Station and Police Station are spider vents, an alternative to the air conditioning units on the roofs of the casino and mansion. Here is a front view of the Fire Station. My 28mm scale Copplestone Casting's figure of Vampifan appears in most of these photos to help give a sense of scale. Here we see the front and one side of the Fire Station. The double height walls surrounding the large front doors have been glued together. The sign above the doors has also been glued in place. The fancy topping at the front of the building has also been glued together. It is unlikely I would ever want to disassemble them. Here is a front view of the Police Station. Unlike the Fire Station, the Police Station does not come with any exterior walls. I chose these walls for no other reason than I liked the look of them. 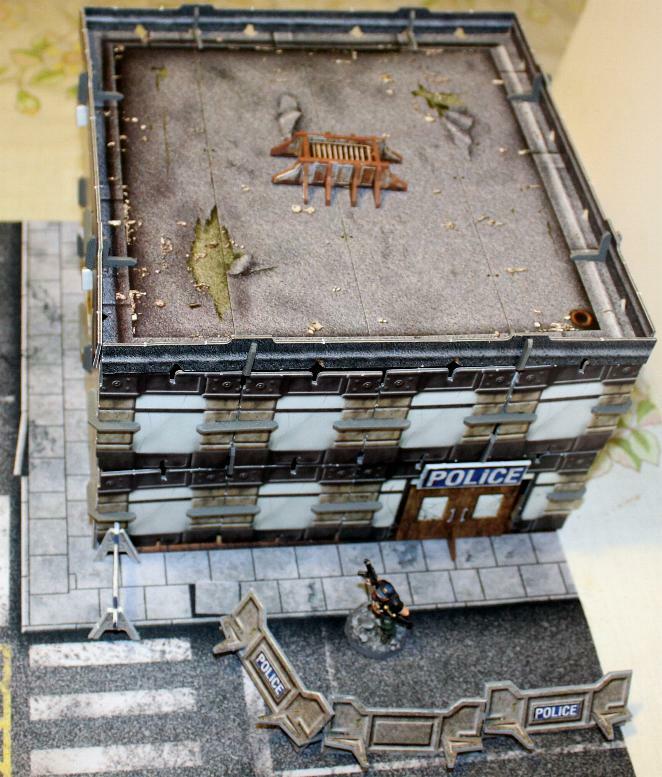 The Police Station comes with lots of cool extras like these concrete barriers and the wooden saw-horse. The barriers are reversible with a police sign on one side and no signage on the reverse side. Both sides are shown here. 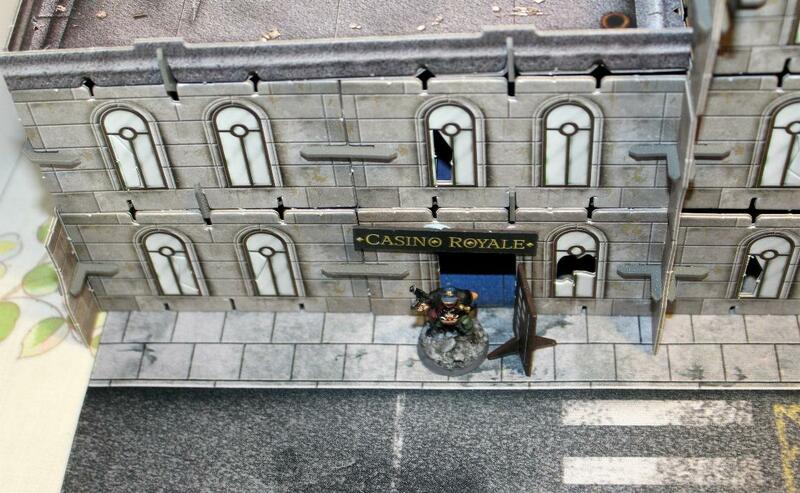 Here is Vampifan standing outside the Casino Royale. The casino utilises the exterior walls from the Art Deco set. It contains furniture items for both a casino and a restaurant. The Art Deco set is filled with exterior walls, interior walls, gantries and staircases. It is a great add-on that adds variety to the other three types of exterior walls. I have made a large mansion as well as the casino with the sets I own. I have included a cool-looking mailbox from my Street Items set. Note that I have cut off the extruding tabs and painted the edges. Yes, it is the American design. The designers have gone for an American setting for their apocalypse despite being a UK-based company. Personally speaking, I don't have a problem with that decision. 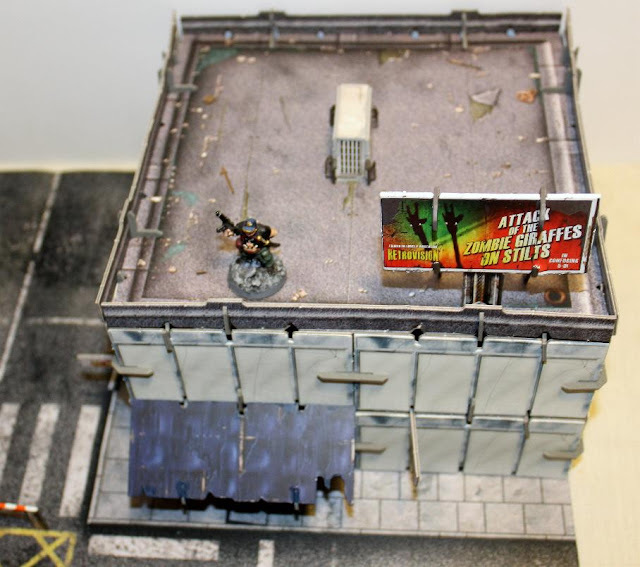 I will mainly be using these sets in my ATZ-FFO and Judge Dredd campaigns, both of which are set in the USA. Moving inside, Vampifan starts his tour with a look at the Fire Station. Against the far wall are a set of lockers. 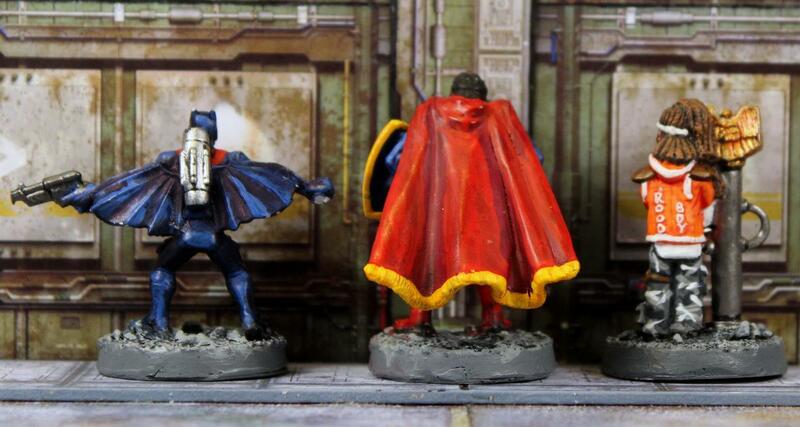 The one item I love the most from this set is the coat rack with four bulky firemen's coats hanging from it. What a great addition! The metal stairs lead up to a metal walkway that overlooks the ground floor. On the upper floor are the offices and rest room. Obviously they need more furniture adding to them. Here, I have included two shelf units and an office desk. This is the ground floor of the Police Station. Once again, it should have a lot more furniture in it. I added a couple of desks to the two offices. On one I added a computer keyboard and monitor. It is these little touches that helps bring a building to life. Also, please note that all of my furniture items have been edged with paint. The stairs are part of a sheet called "Really Useful Items." Moving up a floor, Vampifan comes to the prison cells. In addition to the bed, each cell should also contain a toilet but I hadn't made them when this photo was taken. Crossing the street, Vampifan enters the casino. Here I have added a large bar. Note the beer pumps. The three gaming tables feature options for blackjack, poker or roulette. This set also contains items for use in a restaurant. The tables all come with reversible tops. The rectangular table has a snooker top on its reverse side and the two circular tables show dining table tops on their reverse sides. 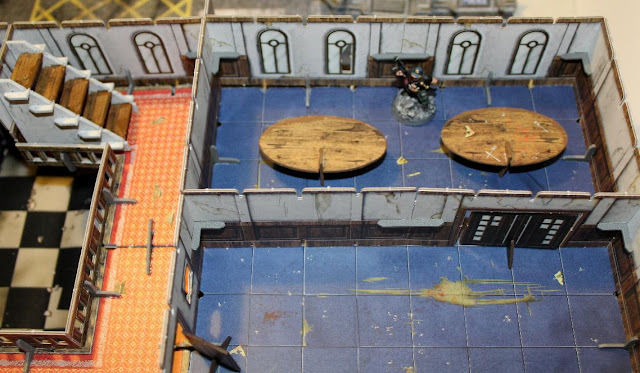 The upper floor of the casino shows a large dining room, which Vampifan is checking out. A side door leads to the mansion next door. In the mansion, Vampifan stands at the top of a set of stairs leading up to a brightly carpeted balcony that overlooks the entrance hall. A less ornate set of stairs at the far end of the balcony leads up to the top floor. This is the ground floor room at the far side of the mansion with broken windows. You can leave them unbroken if you wish. I have gone for a roughly 50/50 split between broken and unbroken windows. Finally, Vampifan makes his way to the top floor, which I have left unfurnished. Doors at either side lead off to the lower roof of the mansion and the roof of the casino. These are all great add-on sets that give you lots of extra options and variety as well as many cool items. They may well be optional extras but for me they were a necessary purchase. The second instalment of my Judge Dredd Miniatures Game campaign follows on one week in game time and real time from the first one. Now that Judge Scott has disposed of the Barko Brothers, who were in control of a shanty town territory in a slum district of Sector 13, the residents are undefended. Lurking just below them in the Undercity are a gang called the Scabies, led by Scab Scabie. With immediate access to the shanty town, Scab decides to cause mayhem to the local residents by blowing up their power generator. 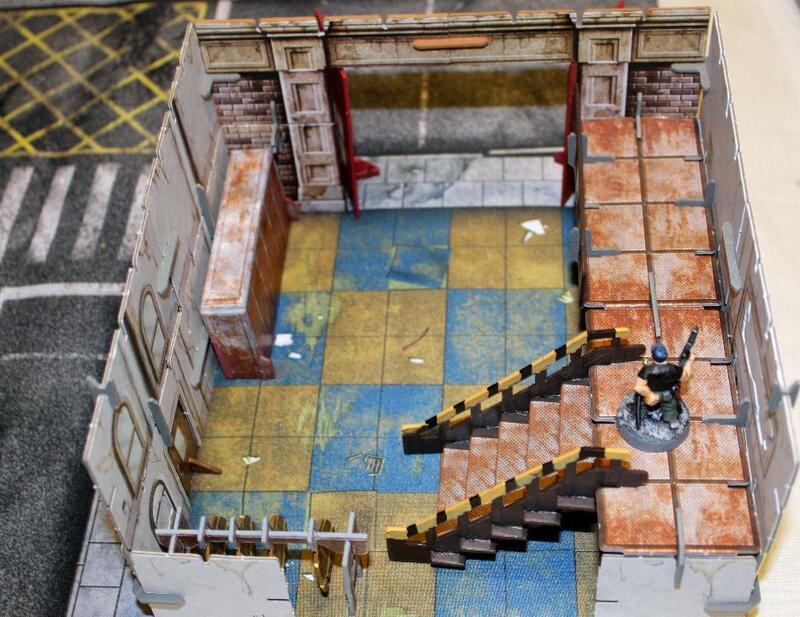 This scenario is based on the Demolition standard scenario found on page 21 of the Blood on the Streets supplement. Street Judge Burnett - Level:1 Infantry Hero with 0 Experience Points and worth 160 Credits. Stats - Move 5", Agility +1, Shoot +3, Melee +1, Melee Dice 2D, Will +1, Armour +5, Hits 2. Equipment - Boot Knife, Daystick, Lawrod Rifle, Stumm Gas Grenades and Standard Issue Armour. Talents - Accurate and Boom! Head Shot. Street Judge Moore - Level:1 Infantry Hero with 0 Experience Points and worth 150 Credits. Stats - Move 5", Agility +2, Shoot +2, Melee +1, Melee Dice 2D, Will +1, Armour +5, Hits 2. Equipment - Boot Knife, Daystick, Lawgiver Mk II Pistol, Stumm Gas Grenades and Standard Issue Armour. Talents - Accurate and Close Combat Shooter. Street Judge Webb - Level:1 Infantry Hero with 0 Experience Points and worth 150 Credits. Stats - Move 5", Agility +2, Shoot +1, Melee +1, Melee Dice 2D, Will +2, Armour +5, Hits 2. Talents - Agile and Stealthy. Med Judge Nash - Level:1 Infantry Hero with 0 Experience Points and worth 150 Credits. Equipment - Boot Knife, Medi-Kit, Lawgiver Mk II Pistol and Standard Issue Armour. Talents - First Aid and Medic. Scab Scabie - Level:2 Punk Infantry Hero with 2 Experience Points and worth 220 Credits. Stats - Move 5", Agility +0, Shoot +1, Melee +2, Melee Dice 2D, Will +0, Armour +3, Hits 3. Talents - Luck of Grud, Skilled and Deadly and Voice of Command. Squama - Level:1 Punk Infantry Hero with 1 Experience Point and worth 155 Credits. Stats - Move 5", Agility +1, Shoot +1, Melee +0, Melee Dice 2D, Will +0, Armour +3, Hits 2. Equipment - Grenade Launcher (use stats for Hand Bomb but increase range to 20" and double cost to 60 Credits, Respirator and Leather Armour. Talents - Maximum Firepower and On Their Knees. Scatty and Scurf - Level:1 Punk Infantry Heroes with 0 Experience Points and worth 110 Credits each. Stats - Move 5", Agility +0, Shoot +2, Melee +0, Melee Dice 2D, Will +0, Armour +0, Hits 2. Equipment - 2x Sawed Off Stump Gun Rifles and Respirator. Talents - Brave and Dual Shooter. Branny, Crusty and Flaky - Level:0 Punk Infantry Minions with 0 Experience Points and worth 35 Credits each. Stats - Move 5", Agility +0, Shoot +0, Melee +0, Melee Dice 2D, Will +0, Armour +0, Hits 1. Equipment - Stump Gun Rifle and Respirator. The Justice Department fielded a force worth 610 Credits against the Scabies street gang who were worth 700 Credits. With a Level:2 Hero leading them and comprising three Level:1 Heroes and 3 Level:0 Minions the Scabies had a slight advantage. 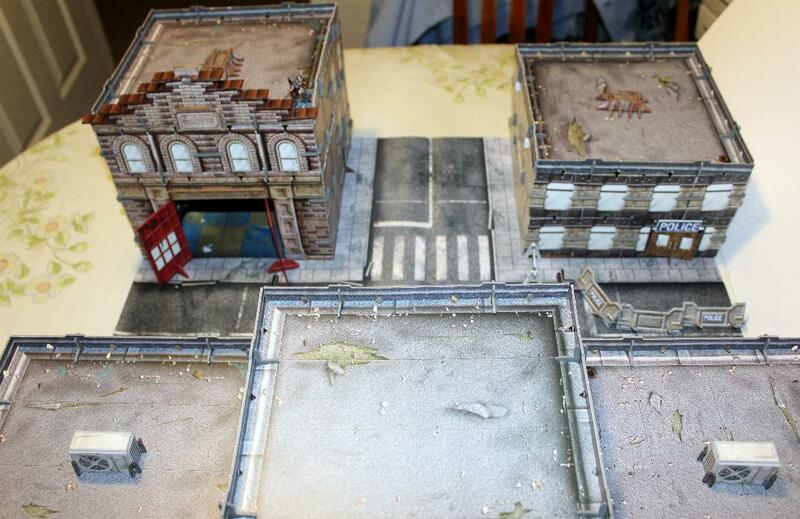 I played my fight on a four feet by two feet battlefield using gaming mats, buildings and scenery items from my Battle Systems Urban Apocalypse Shanty Town sets. The Scabies deployed their force 10" in from one of the short edges. The Judges deployed 10" in from the opposite short edge. 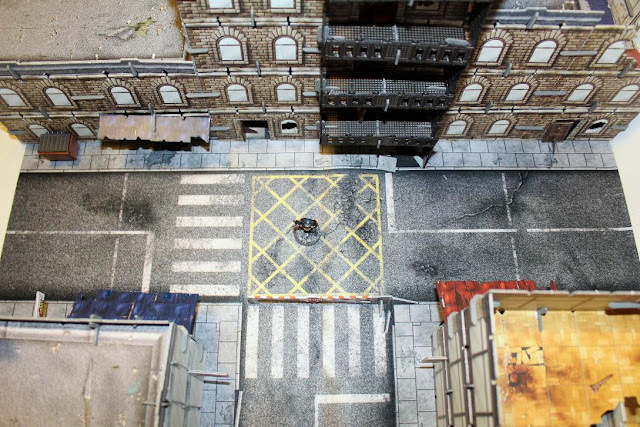 I used the generator from my Battle Systems terrain sets as the objective and it was placed in the centre of the board. As written, the attacking force (the Scabies) are meant to act first. However, when I played the game that way, the Scabies destroyed the objective far too easily before the Judges could even reach them. That was boring and would have made for a very poor batrep. So I decided to replay the game with the Judges going first. It made for a much closer contest. Every model in the attacking force (the Scabies) is assumed to be carrying a high explosive device. 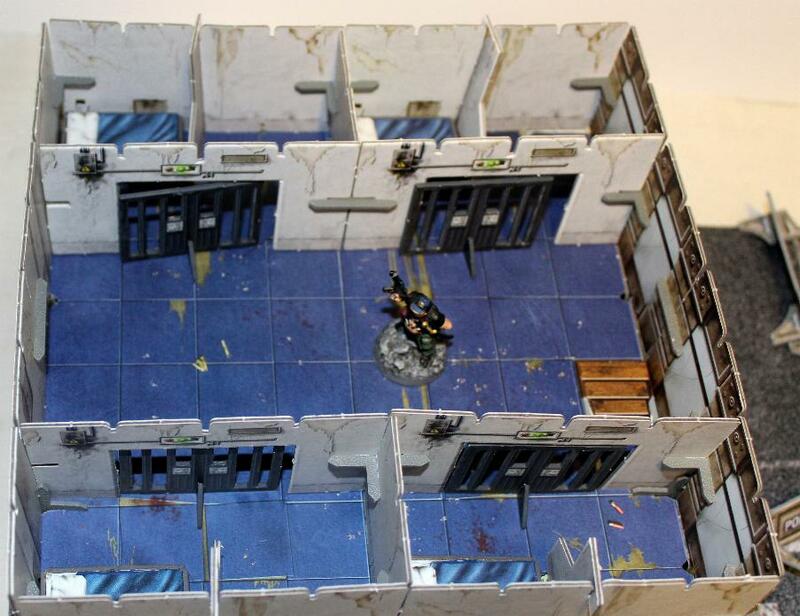 In order to destroy the objective, a model must move into base contact with it and perform eight Special Actions arming the explosives. These Special Actions need not be performed consecutively and the model is permitted to perform other actions while setting up the explosives. 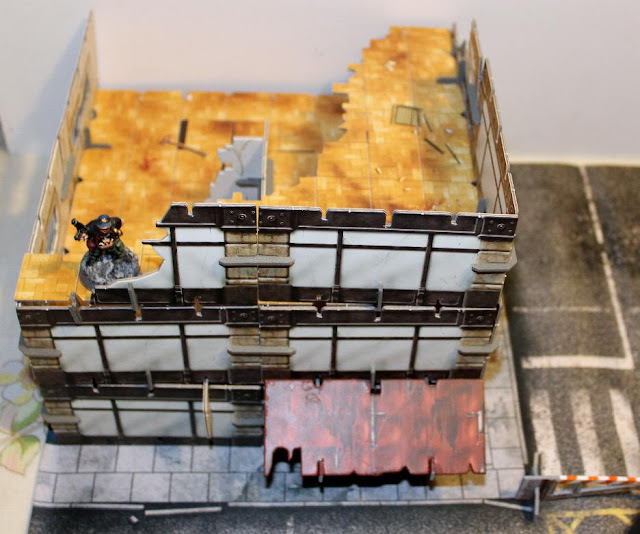 If the model is removed from the table or leaves the objective, keep a track of how many Special Actions he performed arming the explosives. Another model is free to move into base contact and continue the task until a total of eight Special Actions have been performed. If the attacking force destroys the objective, it will be victorious. If the defending force destroys or drives off all of the attacking models, it will gain victory instead. If you find the pictures and captions are too small to see or read, don't worry. There are a few simple solutions. The easiest solution is to left click on that icon at the far right of your menu toolbar at the top of your screen. It's the one with the three parallel grey lines. That will give you a pop up menu. Left click on the plus symbol (+) to the right of the percentage number and keep pressing until the screen picture is big enough for you to read. My default setting for my blog is 170%. For reading the comic, I'd suggest going up to 200% or higher. The second method is a bit more involved. First, left click on any of the pics. This will take you to a new screen showing all of the pics without the text. 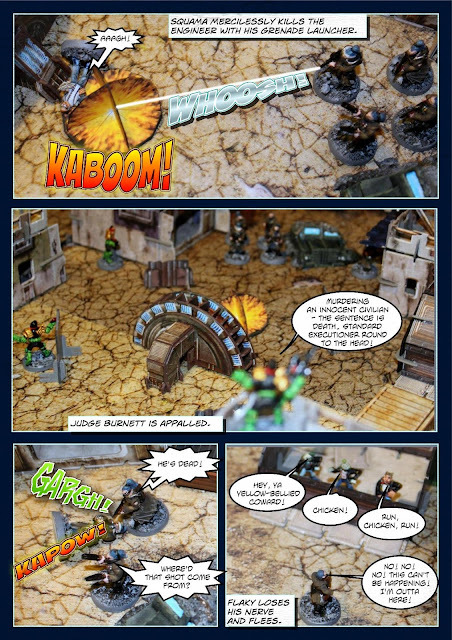 Next, right click on any of the pics, say for example page 1 of the comic. This will give you a menu of options. Left click on the top one, View Image. If you hover your mouse over the picture, you'll see a plus sign in a white circle. Left click it and the picture will double in size, making it very easy to read. If you press the arrow key at the top left corner of your menu toolbar that will take you back to the blog. Sadly, you'll have to go through this procedure for every picture you want to magnify but it's only a few clicks so it shouldn't be too much of a hassle. Scab Scabie took a crippling wound to the head (suffers a -1 penalty to his Psi, Shoot and Will stats). He served a full sentence in the iso-cubes. Squama and Scurf were both killed by chest shots. Scatty's wound was just a scratch. He served time in the cubes. As did Branny and Crusty. Branny was also injured in the right arm (suffers a -1 penalty to his Agility stat). Flaky, who ran away, was never seen or heard of again. The four Judges did well with the experience they gained from this mission. All advanced to Level:2. +1 for surviving the battle. +1 for slaying a level:1 Hero. +2 for slaying a Level:2 Hero. This earned him 4 Experience Points, enough to raise him to Level:3. However, as I told you last time, a Hero can only advance one Level per game, so Judge Burnett became a Level:2 Hero with 3 Experience Points. He added +1 to his Agility stat, to give him a score of +2 and +1 to his Hits, bringing them up to 3. 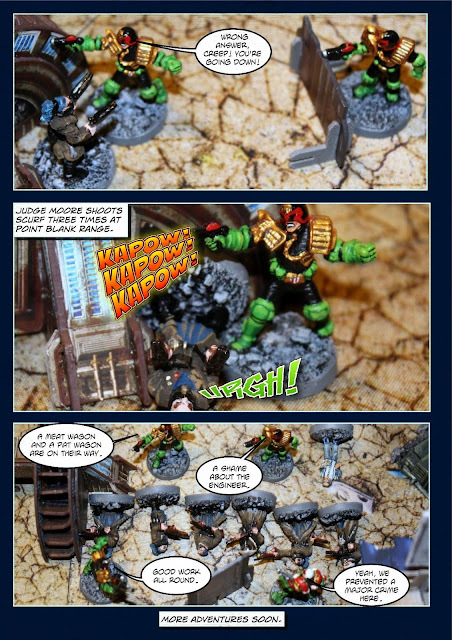 He acquired a new Talent from the Sniper Judge list - Timed Fuse, which allowed him to detonate a High Explosive round in mid-flight instead of on impact. Properly adjusted, this can allow a round to explode above the head of a target behind cover, depriving them of their shield. He also put in a requisition request for a Rifle Scope for his Lawrod Rifle. This was accepted and now his Lawrod has a range of 36" instead of 24". The downside is that he can only fire one Standard Executioner round at a time instead of three. It cost 20 credits and with his +25 Credits Level increase made him worth 205 Credits. +1 for slaying 1 Minion. This earned him 3 Experience Points, enough to raise him to Level:2. He added +1 to his Shoot stat, to give him a score of +3 and +1 to his Hits, bringing them up to 3. He acquired a new Talent from the Gunslinger list - Crackshot, which gives him a -1 bonus to the AP score of any shooting weapon he uses. His Credits score increased by +25 to 175. +1 for arresting 1 Minion. This earned him 2 Experience Points, just enough to raise him to Level:2. He added +1 to his Shoot stat, to give him a score of +2 and +1 to his Hits, bringing them up to 3. 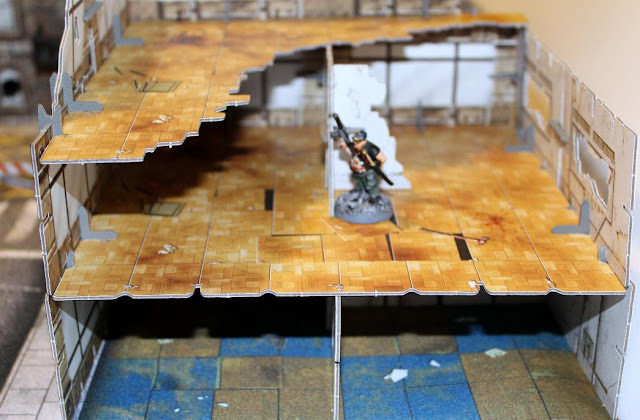 He acquired a new Talent from the Sneaky Does It list - Infiltrator, which allows him to be placed on the table after all the models of both forces have been deployed. He may be placed anywhere up to 15" away from another member of his force, so long as he is not in Line Of Sight or within 15" of any enemy model. His Credits score increased by +25 to 175. This earned him 2 Experience Points, which was just enough to raise him to Level:2. He added +1 to his Shoot stat, to give him a score of +2 and +1 to his Hits, bringing them up to 3. He acquired a new Talent from the Hands of a Healer list - Nurse, which allowed him to automatically negate two characteristic penalties that have resulted from injury, except those resulting from a body part being torn off. His Credits score increased by +25 to 175. I do hope that Clint (Judge Burnett), Simon (Judge Moore), Roger (Judge Webb) and Andy (Med Judge Nash) were all satisfied with the performances of their alter ego characters. It pleased me enormously that all four advanced to Level:2. I certainly enjoyed playing this scenario and creating the comic is almost as much fun. 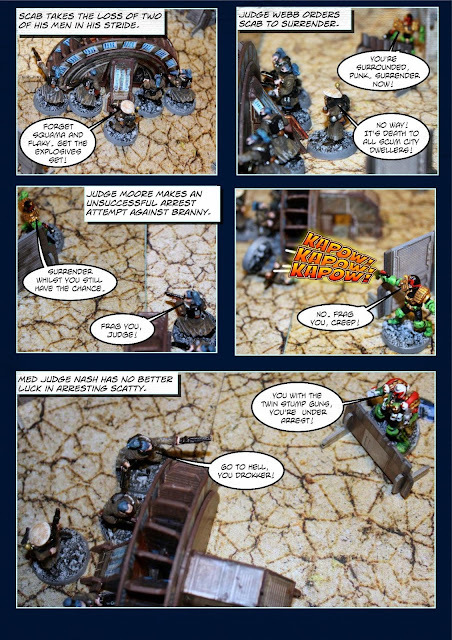 The comic format has proved so popular that it will remain a part of all of my JDMG batreps. Oh, and if you're wondering why the Judges had such limited success in their arrest attempts it is because a Hero will automatically resist any attempt to arrest him unless he decides to voluntarily surrender. However, despite this, a Judge must still attempt to make the arrest challenge before resorting to more violent measures. Minions, on the other hand, are far easier to arrest. Only if a perp (whether Hero or Minion) uses a Melee, Psi or Shoot action against a Judge or resists arrest, may a Judge use force to subdue him. This post originally appeared in The Gamer's Cupboard blog, which has now died and is lying in the morgue awaiting either burial or cremation. 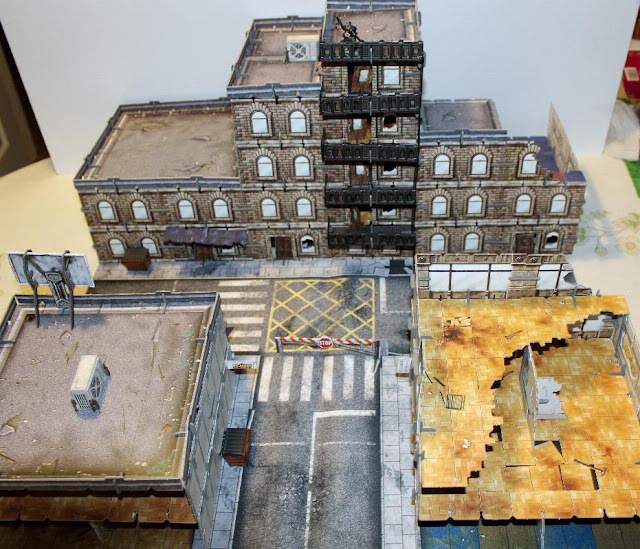 I used to be an editor of that blog and whilst I'm not that bothered that most of my posts for it will be lost forever, there were two, featuring my reviews of the Battle Systems Urban Apocalypse Terrain sets that I wanted to keep, hence my decision to repost them here. The text has been slightly modified to bring it more up to date. I know that some of you will have already seen this post before. Please bear with me. But most of you won't have seen this post before, as the Gamer's Cupboard only had a very small following. 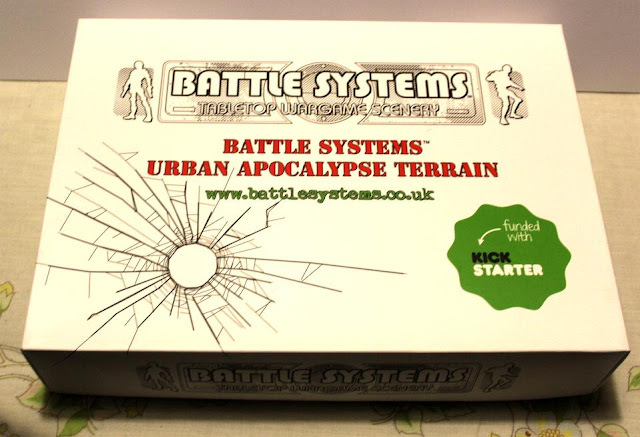 As soon as I saw the notice that Battle Systems were planning to launch an Urban Apocalypse Terrain set project on Kickstarter in September 2015 I knew I had to back it. Of all of the Kickstarter projects I have backed, this was the one that excited me the most. As each new stretch goal and add-on was announced I knew that a) I wanted it, and b) this was going to cost me a fortune. In short, I wanted everything that Battle Systems produced for this project. At first, it was just the city scenery, but one pack would never satisfy my needs. So I ended up ordering four full sets. It was cheaper buying the four together than four sets separately. This was enough to cover an area 4 feet square. Then the Shanty Town sets were announced and I saw even more possibilities. I ordered two full Shanty Town sets. Just as the project was drawing to a close, Battle Systems added suburban houses and of course, I wanted them. 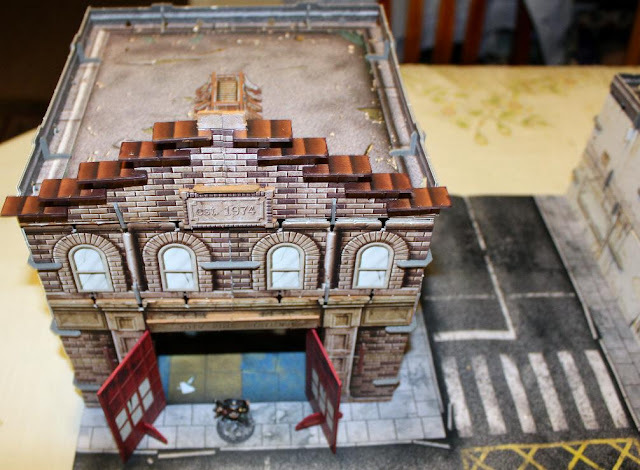 Combined with other add-ons like the fire station, police station, art deco buildings, diner/casino and loads of other scenery items I ended up ordering a whole load of goods. This was something I REALLY, REALLY wanted. I could see my gaming hobby being transformed by these amazing sets. 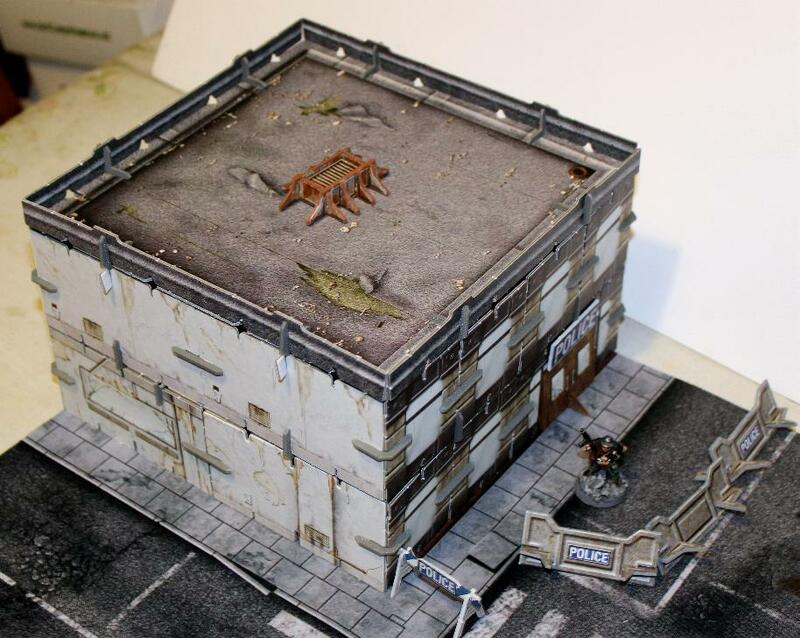 Building card terrain and buildings is something I have always been interested in. Indeed it first started in the late 1970's when I began scratch-building 54mm scale Wild West buildings. 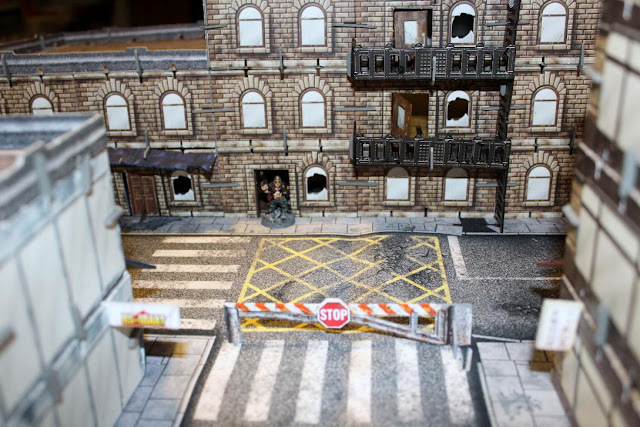 I learned a lot from making them and that experience stood me in good stead when it came to making 28mm scale buildings and scenery for my zombie apocalypse games. I began making 28mm buildings in the early 2000's and started off by making contemporary buildings and scenery produced by World Work Games. I then moved on to the catalogue of card models from Stoelzel's Structures. 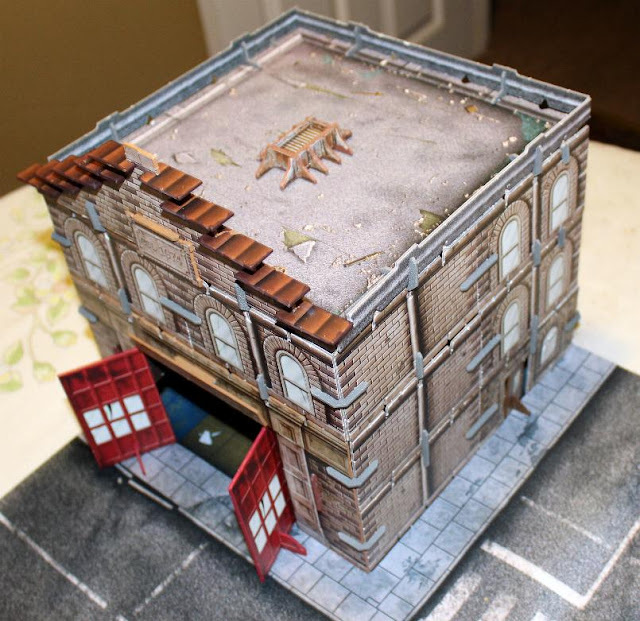 I made loads of card buildings for my zombie apocalypse games but in recent years I have slowed down considerably. These new sets by Battle Systems were like a breath of fresh air to me. 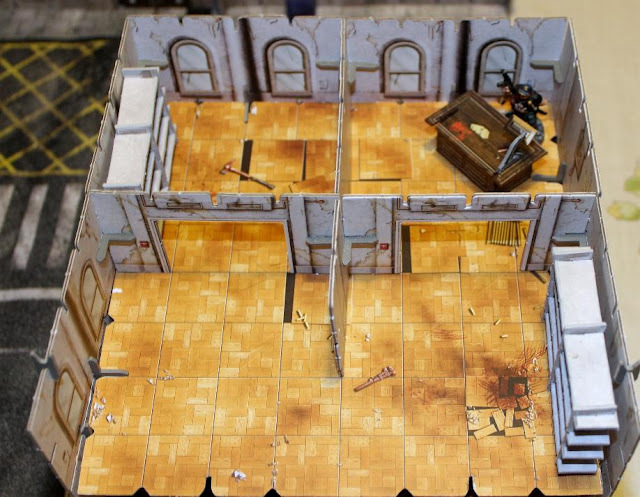 They had everything I loved about card terrain - interior details, detachable floors and roofs, made of thick card for strength and durability, incredibly detailed textures and of course, furniture and other scenery items to help bring a gaming board to life. Plus, these had the added bonus of being quick to assemble with no gluing required (although I do glue small items like furniture and street items). 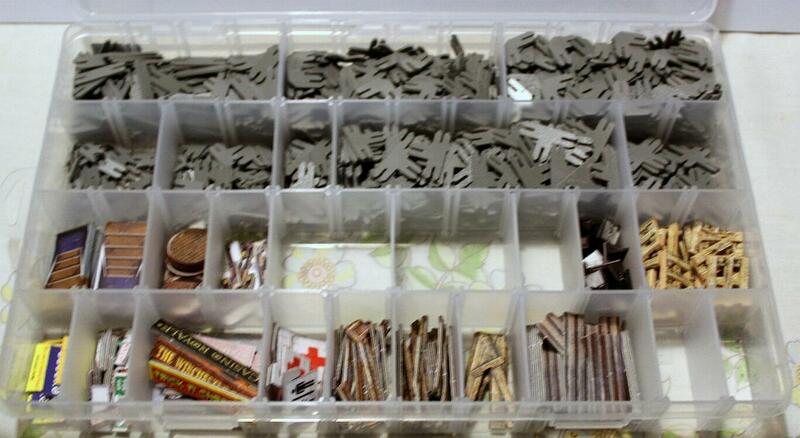 And when you've finished your game you can un-clip them and store everything away flat. Absolutely perfect! 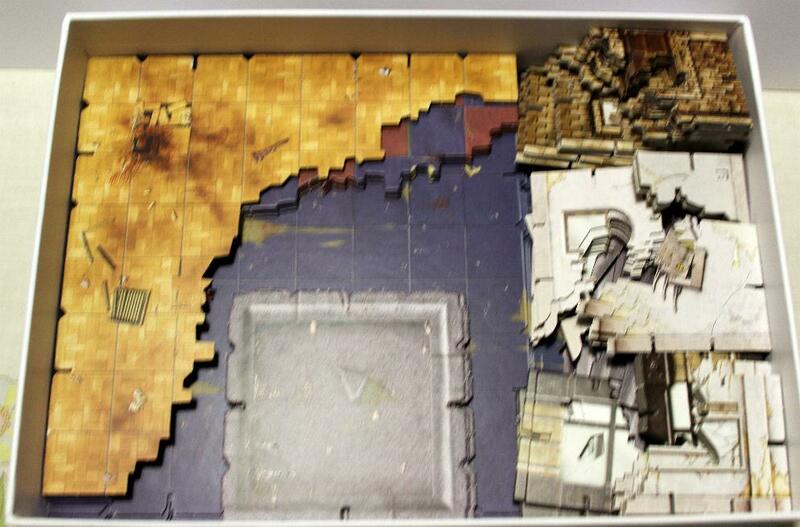 Shown in the photo above is one of the boxes that the Urban Apocalypse Terrain sets came in. The Shanty Town sets have a different cover. Inside the box are some of the items you get with this set. Shown here are the floors, roofs, ruined walls and hidden under those walls are the rooftop railings. I'm using the boxes to store all of my large flat items. In this box are all of the undamaged walls from this set. This box, like the one above, contains the pieces from four boxed sets. It includes three types of exterior walls. All of the interior walls are identically coloured. The doors that come with the walls are kept in a separate box, which I haven't shown. This plastic compartment box of mine (I have loads of these, which I buy online from Amazon UK, and they are very versatile) contains all of the grey plastic pegs (shown in the top two rows) used to clip the parts together. 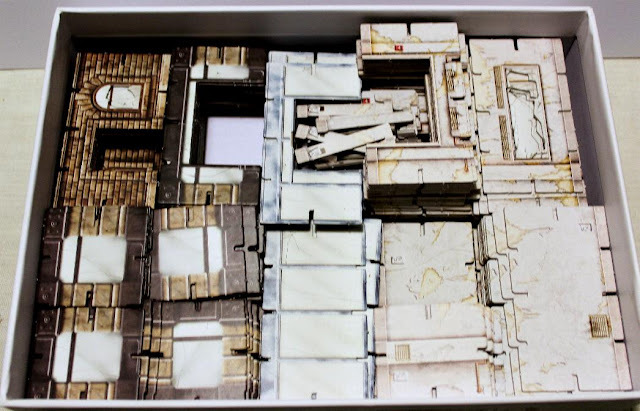 You will need a lot of them and although you get enough in each boxed set to make all of the contents of that box I ordered some extras just to be on the safe side, in case I ever make a massive town set. The other two rows contain counters to show the placement of stairs, manhole covers, lots of signs, computer monitors, wooden pallets and an assortment of scatter items. So, let me show you what I came up with for my very first build. 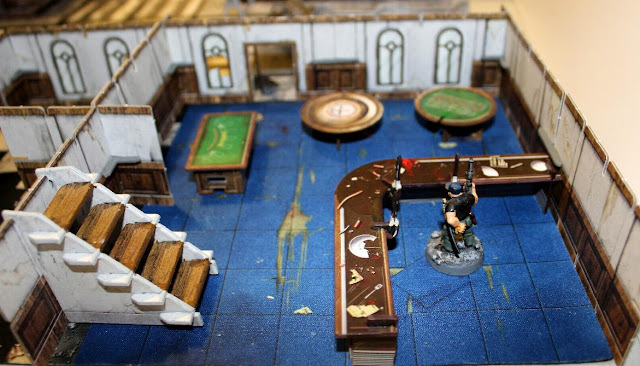 First of all, this set up uses one of the gaming mats, which I must say are superb. The colours on them are so rich and vibrant but more importantly, very realistic. The mats are made up of strong neoprene plastic that can be folded up after use but still retains its shape when laid out flat. I love them! Here is a different wide angle shot. Note, that with these sets, you need not be limited by the space you have on your gaming table. One obvious solution if you're strapped for space is to build upwards. I have tried to show this by showing what a five-storey apartment can look like. 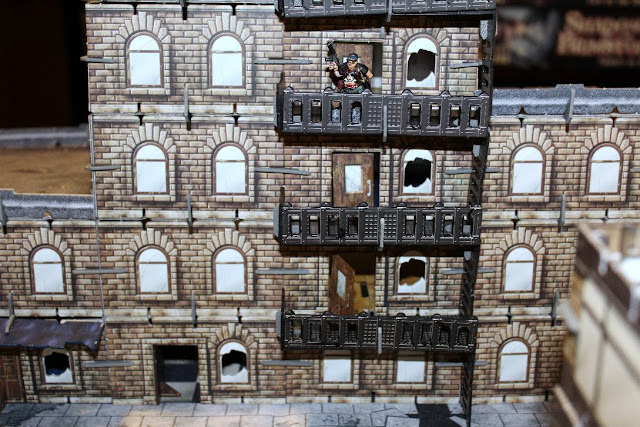 Oh, and how cool are those fire escapes? I have placed my 28mm scale figure of Vampifan in all of these photos to give you a sense of scale. That apartment is 600mm wide (approximately two feet). From the front, the apartment looks like one big building but it is actually made up of three separate buildings. To be fair, by placing internal walls with doors there is nothing stopping you from making it one big building or even numerous smaller buildings all combined into one block. Here is a closer view of Vampifan on the roof of the fifth storey. In case you're wondering, it took me just under three hours to build this cityscape. Here we have an overhead view of this set-up. 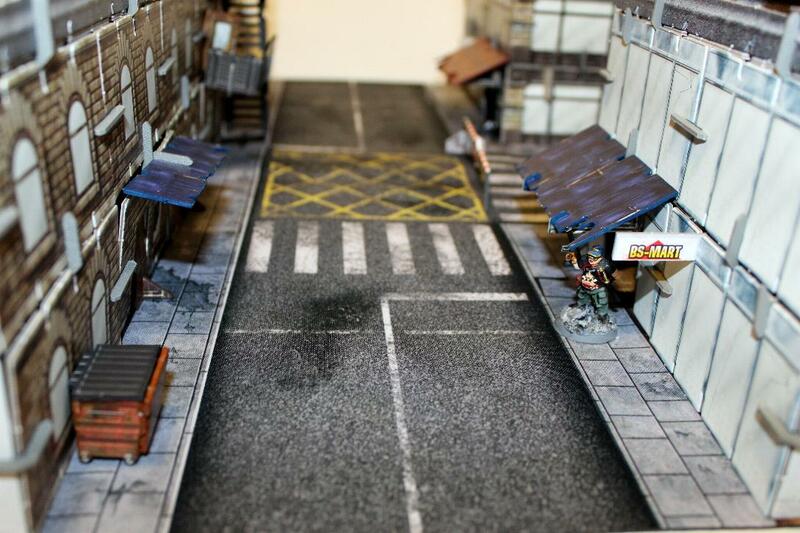 Finally, here is a shot showing the main street from closer to ground level. You get two types of awnings for your buildings - wide (shown to the right) and narrow (shown to the left) in red or blue. I have made loads of street furniture and interior furniture but I have only shown a few of them. In the foreground you can see a dumpster. The lid comes off but if you prefer you can glue it in place. I have glued the sides of it but left the lid detachable. I wonder if the BS-Mart sign stands for Bryan Scott's Mart? Probably not, but it's nice to think so. Let us have a closer look at the three buildings starting with the ruined store. Actually, the lowest two floors are intact but the top floor has suffered major damage. 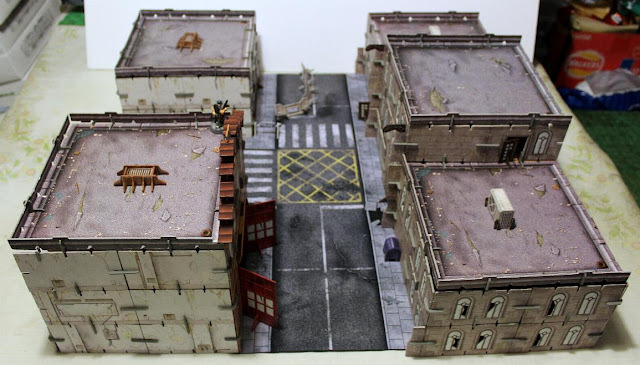 This explains why this city set is called Urban Apocalypse Terrain. It is specifically designed for a post-apocalypse setting. You don't have to make every building a ruin. Check out the supermarket shown in greater detail below. Here, Vampifan has dropped down a level. 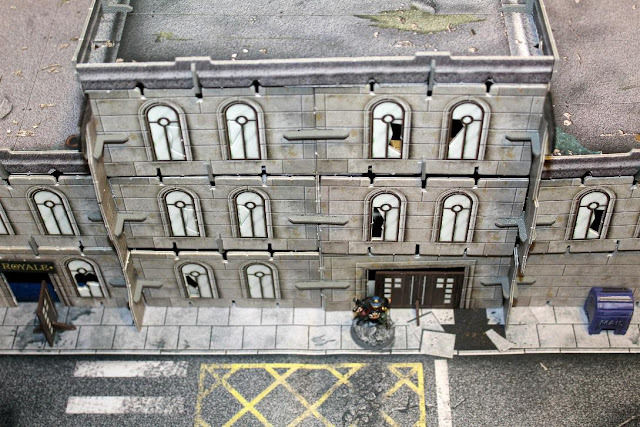 I have added a few internal walls to these buildings but I have not added any back walls. Normally, I would include back walls. They are useful for photography purposes if they'd be seen in a photo but for gaming purposes they can be left off to make it easier to place figures inside. 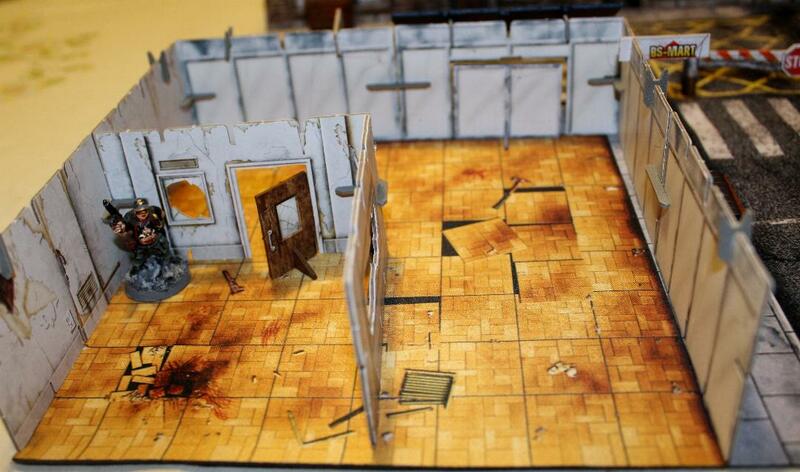 Of course, all of the floors and roofs are detachable. They are just lightly clipped in place, making it easier to remove a floor or roof to gain access to the interior. This is the two-storey supermarket. The walls are meant to represent glass and metal. 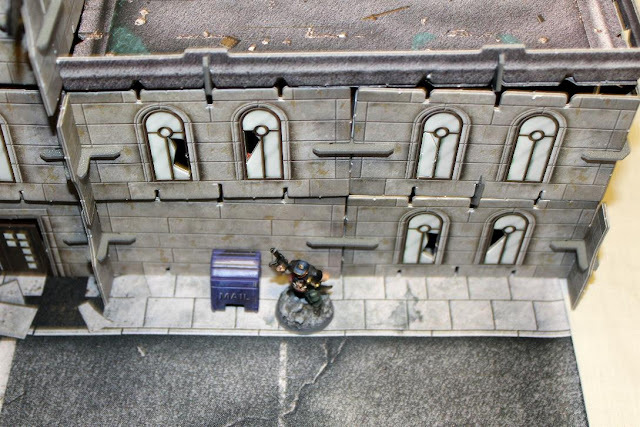 They do work but I am used to making all of my windows for my card buildings out of transparent plastic. Given the restraints of the designs I know this would not be a feasible option. Still, I do miss my transparent windows, but hey, this only a very minor complaint, so it's no big deal. The billboard on the roof is one of two designs you can use, but I guess you could always use your own poster, suitably cut to size to use instead. It's something I'm planning on doing. In the centre of the roof is an air-conditioning unit. 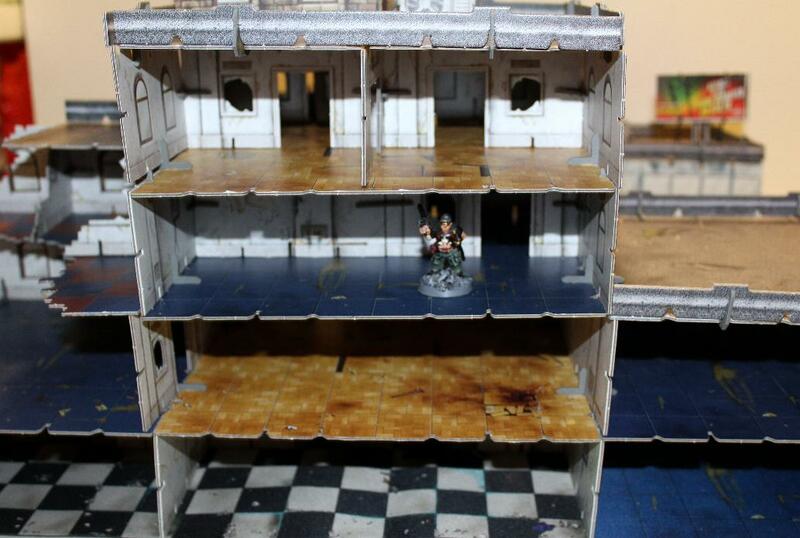 Here I show the ground floor of the supermarket with the upper floor removed. Note the door to the small room Vampifan is in comes with a small stand. It is up to you whether you want your doors open or closed. This one is partially open. The double doors at the front of the store are closed. Once I add my furniture items these buildings will really come to life. Vampifan has moved across the road to the large apartment building. The Stop barrier is one of the many street furniture items I have made. One thing to point out about it is that I painted the edges of it. This is very important. Trust me on this ! You can use felt-tip pens if you want. I have a thick black magic marker that I use on the edges of any items that are black, like the fire escapes. The beauty of edging is that it brings an item to life and makes it look like it should and not an obvious cardboard cut-out with jarring light grey edges. I prefer edging with paints because I can get a much closer match to the surrounding colours but my god, it is slow and tedious work. Still, just look at that Stop sign and appreciate how realistic it looks. Vampifan is now moving up the fire escapes. I have to admit, these are one of my favourite building accessory items. They really bring this building to life. Plus, just imagine the fun you can have on them in a game. So many possibilities! Moving inside, Vampifan wonders what happened to all of the furniture and all of the people? Is he the "Last Man on Earth"? And where's that mournful wailing sound coming from? 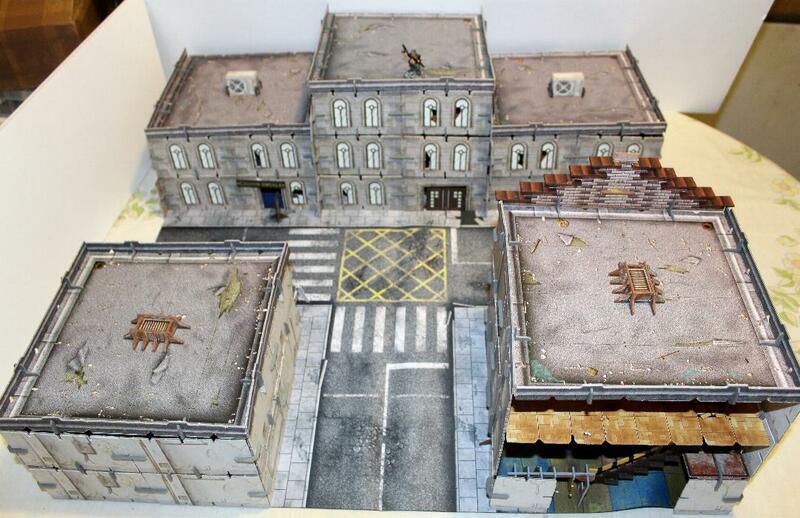 This is just meant as a small insight into what can be done with a few of these boxed sets. There were far more walls and floors that I didn't use than those I did use. Plus you can combine these sets with any of the other sets in this range. I have just concentrated on a few pieces from one of the Urban Apocalypse sets. 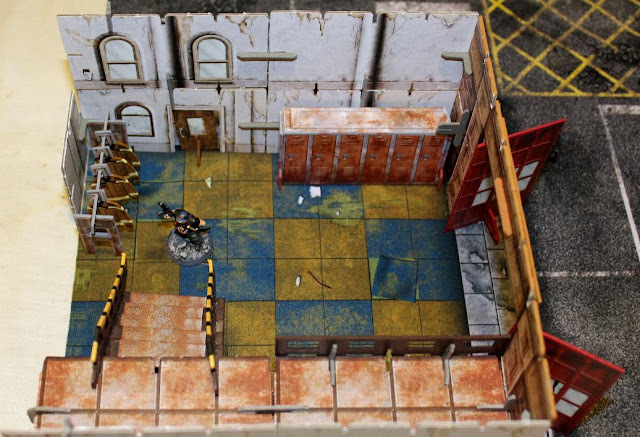 Still to come will be reviews of the Shanty Town sets, the fire station, police station, art deco mansion, suburban houses and lots more, including mixing and matching sets. My god, I am in gaming heaven! My mind is filled with ideas of what I can do with these sets in future games. Yes, I will be starting up a new All Things Zombie campaign, starring Vampifan once again, but most likely with new supporting characters. But before then, I will begin my long awaited (well, for me anyway) Judge Dredd Miniatures Game campaign. 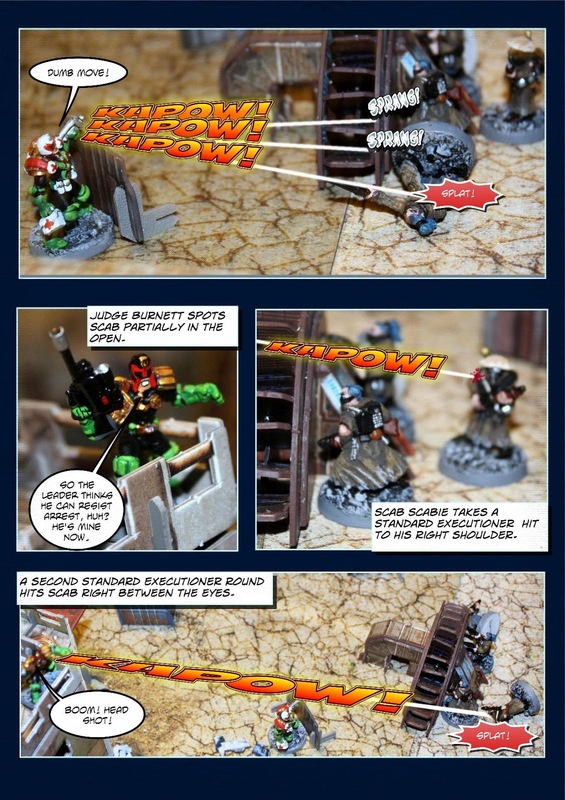 I have played many games of Judge Dredd using various rules sets including a couple I designed myself. But they all used flat 2-D maps for gaming on. 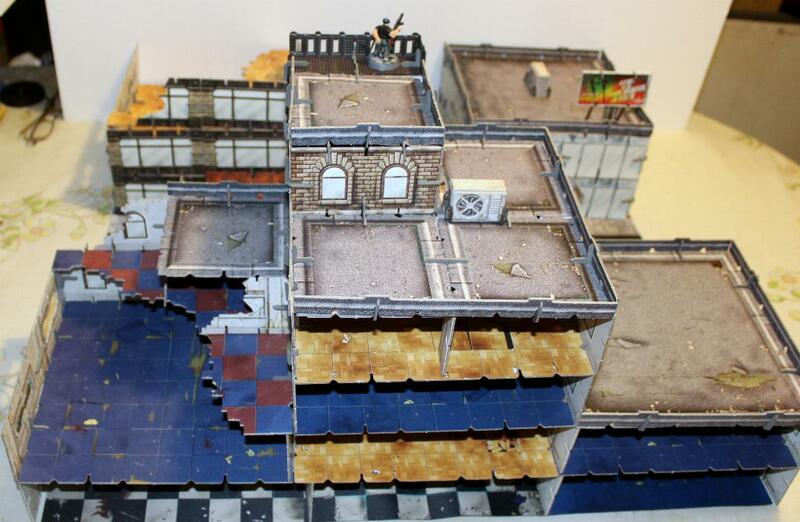 It was always a dream of mine to play Judge Dredd using 3D terrain. Now that dream can come true. 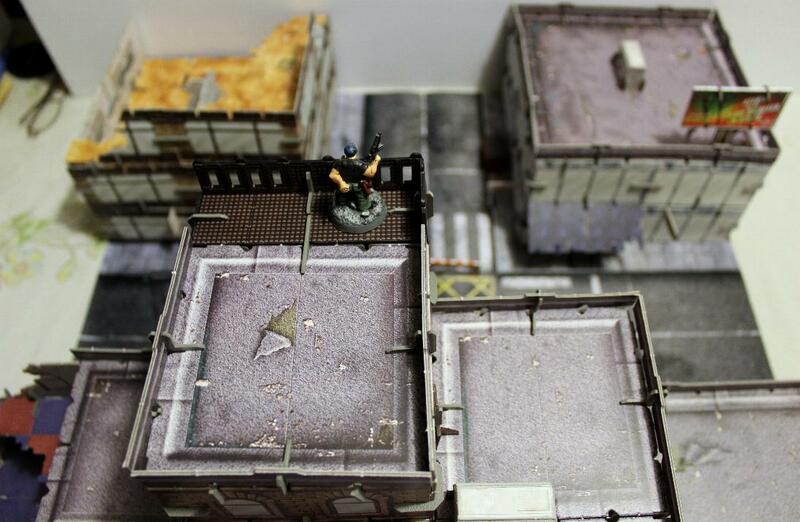 Recently, Mega City one suffered catastrophic damage, so much of it lies in ruins. This makes these sets ideal for gaming in the "Big Meg". Even better, Battle Systems recently announced that their next Kickstarter project will be sci-fi terrain. It's due to start later in 2016. Oh joy! 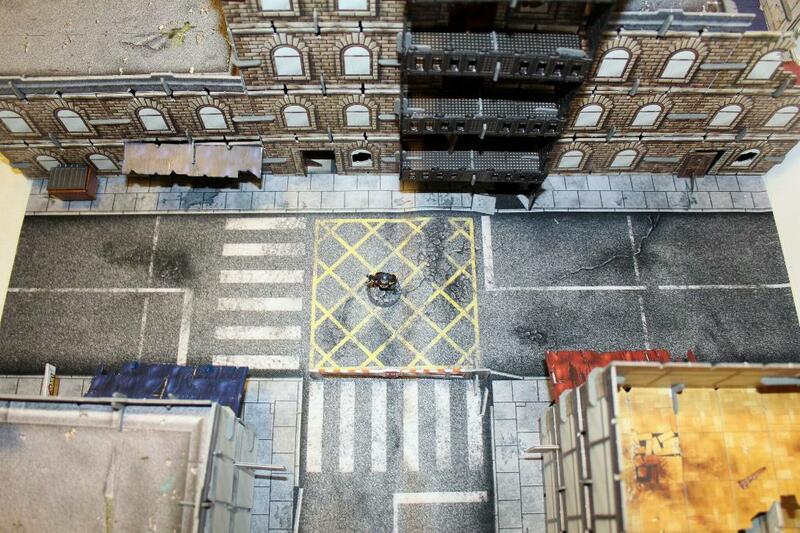 By combining the urban terrain sets with the sci-fi terrain sets I can make a superb looking Mega city One. I can't wait. But, just think of what else you can do with these sets. Just off the top of my head I'm thinking Heroclix and/or Horrorclix, World War 2 city fighting, pulp fiction, 7TV2e style games, cyberpunk gaming, like Shadowrun, for example. So many choices, so many ideas. 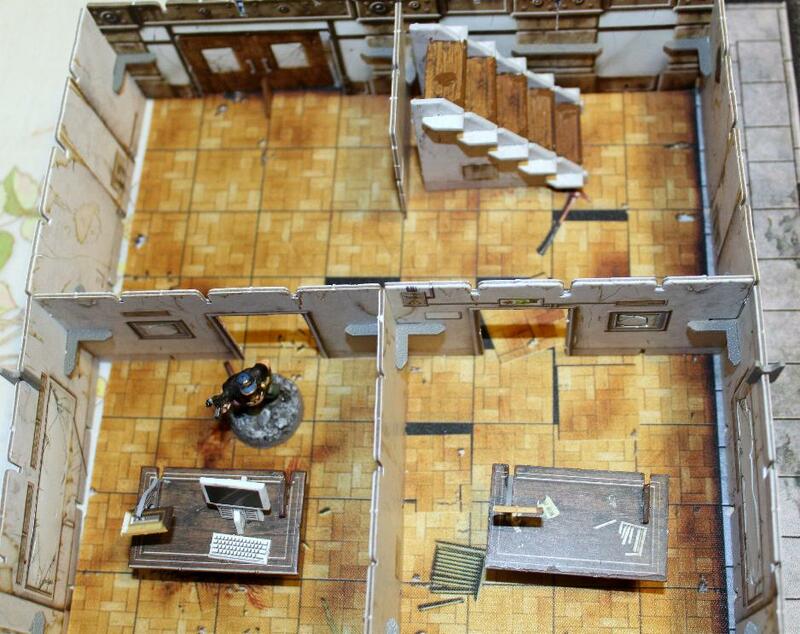 You'll be seeing a lot more of these sets on my blog, particularly in upcoming batreps.